With our Salesforce training in Austin, you’ll gain certified, hands-on expertise in managing and developing apps for one of the most popular CRM products in the world. Our Salesforce training will prepare you to pass the two Salesforce exams and teach you the core administrative features of CRM. You’ll learn analytics and customization skills to tailor the system for your specific implementation and the declarative capabilities of the platform to create applications using the lightning version. This Salesforce certification training course in Austin is designed to ensure that you learn and master the concepts of being a Salesforce Administrator and a Salesforce Platform App builder and ace both these certifications. Our Salesforce training will help you learn how to configure Salesforce, so you are able to collect, analyze and retrieve all of the vital information associated with your customer base. Moreover, you will use Force.com fundamentals to understand Salesforce online application development and the deployment of next-generation cloud apps. We offer practical hands-on learning that will ensure your job success, as well as the theoretical knowledge needed to pass both Salesforce certification exams(Administrator and Developer). What skills will you learn from Salesforce Certification training in Austin? Who should take Salesforce certification training course in Austin? What projects will I work on as part of the Salesforce Administrator and Platform App Builder certification training? Simplilearn’s Salesforce Administrator and App Builder training offers participants the opportunity to work on live industry-based projects that span across unique industry needs. A placement company based in the United States wants to use Salesforce for implementing an end-to-end recruitment process. A team will be formed and you will use your practical knowledge from the course to track the jobs posted by recruiters as well as candidate responses. Further goals of the team involve tracking the information on the candidates, capturing their experience details and work preferences. Most importantly, you will use Salesforce concepts in order to create an effective system, while also incorporating some automated business rules to ease the process. An Australia-based college wants to track the performance of its students and have it automatically update the instructor to alert the instructor if a student has a failing grade. With Salesforce’s Lightning platform feature, the college wants to use the Lightning Process Builder for tracking students’ performance. The end goal is that once the student information is created or updated, an alert message will be displayed on the instructor’s record connected to each student. A UK-based mobile company needs an application to help boost the service provided for its millions of customers. The company wants to track customers who have reported problems with their mobile phones along with the types of issues. Based on these findings, the company wants to streamline the process to give its customers quicker solutions. You will use your Salesforce knowledge to implement an efficient system that also provides more customer satisfaction. What types of jobs require Salesforce trained professionals? Salesforce proficiency is one of the most desirable skills in today’s market, and the market is expected to grow for the foreseeable future. Salesforce is one of the primary technologies used by eCommerce businesses, and its applications make it a very valuable solution for digital marketing departments and a fundamental automation tool for sales teams. Salesforce administrator, Salesforce developer, Salesforce integration developer, Salesforce lightning developer, and SFDC developer are some of the jobs that require Salesforce Admin and Developer Certification. What are the prerequisites for Salesforce training? There are no such prerequisites for this Salesforce.com training course. But prior working experience as an administrator or a developer is beneficial. What is the average salary for a Salesforce Developer/Salesforce Administrator in the US? What are other types of roles within the Salesforce domain available? Which companies are hiring Salesforce Developer/Salesforce Administrator in the US? How do I become a Certified Salesforce Administrator and Developer? To become a Certified Salesforce Administrator and Developer, you must pass the Salesforce Administrator Exam and the Salesforce App Builder Exam. This can be achieved by following the following easy steps. Step 1: Complete this Salesforce training course. Step 3: Pass the Salesforce exams to become certified. What do I need to do to earn my Simplilearn certificate? Complete one project and simulation test with a minimum score of 60 per cent. Complete 85 per cent of the course. 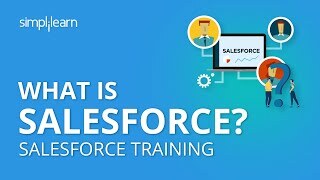 What are the career benefits of this Salesforce training course? According to Glassdoor, Salesforce jobs are increasing at a speed 1.5 times faster than similar roles, and there were 300,000+ Salesforce jobs available. Salesforce Certified Administrators earn an annual average salary of $87,000 but can go as high as $160,000 depending on their knowledge, skills, and experience. How do I pass the Salesforce Exam? The Salesforce Administrator exam is a 90-minute long exam comprising 60 single or multiple choice questions. The passing score for the exam is 65% (i.e you must answer 39 questions correctly). Is this live Salesforce training, or will I watch pre-recorded videos? Amazing training! I am very happy with the format of classes that includes quizzes, lectures, breaks, and Q & A. The assignments are also good. All our doubts are getting cleared while keeping up with the Agenda. Kudos to Simplilearn. Excellent style of teaching with a lot of real-world scenarios, and interaction with the students. The trainer was very knowledgeable, patient, and every question was answered completely. The course has a good learning pace and is very detailed. We also have access to real-world scenarios and the response to questions is excellent. Thank you Simplilearn. I am enjoying the class and learning many different areas regarding the admin area. I'm currently an end user where I work and looking to be an admin to expand my career. I am able to grasp the concepts and the practical training in real time is very good. The training is becoming more and more engaging and interactive. I have to convey that you have an excellent choice of tutors. Though I have prior experience in the field, I am learning a lot more from this course! The training was very detailed. This is the perfect class to attend if you are totally new to Salesforce (like I am). I am learning a lot. Thank You! The classes were really interactive, which is an effective way to learn. Wonderful presentation format, love the examples and pace at which we are being taught. I like being able to collaborate with other users under the guidance of an experienced trainer. I joined this course in order to understand what the new cloud based CRM is and what all opportunities it could bring. I am very impressed by their content and training delivery. The training gave me hands-on in salesforce concepts and their practical applications. The online classroom option from Simplilearn is a boon to working employees, I was able to attend classes from office/home, even while traveling. The season pass helped me gain access into any salesforce class and understand the topic again and again. The course has made me ready to get involved in new projects that might come up in near future. Simplilearn is best for an online course. Its course material is very comprehensive. Faculties and the support staff are really prompt in resolving the queries.The trainer is highly qualified and has great knowledge about the course. In class, each topic is explained with a live example. For working people, it’s very helpful since the trainees can attend the classes on the weekends also. Overall it was a great experience. Thank you Simplilearn. The interactive WebEx learning session tracking the Salesforce study guide has provided a well-defined roadmap for learning the certification subject-matter. Frequent, repetitive review of key subject-matter has been useful to burn key concepts into memory. Interaction with other classmates has been enjoyable. Training is very helpful with good examples. Excellent trainer and excellent experience. The trainer was excellent. This was the best training session in my 10 years of experience. The trainer used real life cases, and the explanation provided was very helpful to understand. Salesforce is one of the most popular cloud-based customer relationship management (CRM) tools used to automate sales, customer service, and digital marketing activities. It was founded in March 1999, by Marc Benioff and has its headquarter at San Francisco. Salesforce enables people in the sales role to track their sales, reach out to customers to solve sales queries, and companies to manage cases and tasks. What is LVC? Is it classroom training? LVC or Live Virtual Classroom training for Salesforce is a live training conducted online via live streaming of a class. LVC is run by a Salesforce certified trainer with over 10 years of work experience that you can interact with during the sessions. In our Salesforce online training, you can raise questions or start discussions at any point during a class session. Moreover, the global audience in attendance can enrich your learning experience and career. Sessions attended by you and your classmates will be recorded and you will receive unlimited access to them for your own future reference. Are the Salesforce training and course material effective? Yes, Our Salesforce Administrator and App Builder training course is designed to guarantee you’ll pass both the exams on your first attempt. With a hands-on learning approach, the training not only gives you the confidence to pass the exams but also helps you retain knowledge beyond the exams. Yes, you can cancel your enrollment if necessary. We will refund the course price after deducting an administration fee. To learn more, view our Refund Policy. All of our highly-qualified CS-Salesforce Administrator and App Builder trainers are Salesforce certified, with more than 15 years of experience in training and working professionally in the field. Each of them has gone through a rigorous selection process that includes profile screening, technical evaluation and live training demonstration before they are certified to train for us. We also ensure that only those trainers who maintain a high alumni rating continue to train for us. Contact us using the form on the right of any page on the Simplilearn website, or select the Live Chat link. Our customer service representatives will be happy to give you more details.